Since then, Gaddafi has been killed and Mr Assad has endured thanks only to Russia’s firepower. The future of Chávez’s successor, Nicolás Maduro, hangs by a thread. Protesters are on the streets of Caracas. Latin American countries and the United States have recognised the opposition as Venezuela’s legitimate government. Europe is sympathetic. But Russia sees its vital interests at stake in Mr Maduro’s survival. Alexander Gabuev of the Carnegie Endowment, who reported on Chávez’s visit to Moscow in 2009 as a journalist, thinks the meeting with Mr Medvedev was a turning point. Previously, he says, Russia viewed Venezuela as little more than an oil-rich market for its weapons. Chávez’s populist anti-Americanism was a bonus. But in 2008, when Mr Medvedev and Vladimir Putin switched places as president and prime minister, things began to change. The global financial crisis and falling oil prices hit Russia hard, while its war with Georgia in 2008 revealed a conflict with the West. At the meeting, Chávez announced that Venezuela would recognise the break-away territories of South Ossetia and Abkhazia, which the Kremlin had helped split off from Georgia in what was virtually an annexation. Chávez had been won over by the frantic diplomacy of Igor Sechin, Mr Putin’s closest lieutenant and deputy prime minister for energy, who was also chairman of Rosneft, the country’s biggest oil firm. Mr Sechin handled Russia’s relations with Venezuela, Nicaragua and Cuba, winning Nicaraguan recognition of the former Georgian territories as well. Venezuela’s recognition had a price. The Kremlin gave it a $2.2bn loan to buy Russian arms, and formed a consortium of five big energy firms to invest in Venezuelan oil fields. Four of those companies have since quietly left the consortium, leaving Rosneft with the risks. Since 2006 Russia has lent Venezuela at least $17bn. Some of that debt has been restructured, but Venezuela still owes Russia $6bn, half to Rosneft. Instead of hedging its bets, Rosneft has continued to pile into Venezuela since Chávez’s death. Mr Maduro has reciprocated by recognising Russia’s annexation of Crimea and awarding Rosneft more licences. Mr Sechin has quashed concerns about the exposure to Venezuela voiced by some members of the government, arguing that Russia should support the country as a proxy in the backyard of the United States, just as Ukraine and Georgia have served as proxies of the United States in Russia’s sphere of influence. The point was driven home by Mr Maduro’s visit to Moscow in December 2018, as pressure on him was rising at home. Days later Russia sent two nuclear-capable TU-160 bombers to Caracas. The 10,000km-long airshow prompted a tweet from Mike Pompeo, secretary of state, denouncing it as “two corrupt governments squandering public funds, and squelching liberty and freedom”. Mr Sechin, the boss of Rosneft, is not just driven by geopolitics. Not only has Rosneft been secretly offered ownership of several petroleum projects, it has also, according to a report by Reuters, become a middleman in sales of Venezuelan oil worldwide, a notoriously non-transparent and lucrative business. Much of this oil ends up at refineries in the United States (despite sanctions against Russia) because it is sold through intermediaries such as oil-trading firms. In Mr Gabuev’s words, “one man and one firm with access to Mr Putin have privatised Russia’s foreign policy and state resources”. Indeed, blurring the line between private and state interests has been a hallmark of Mr Putin’s rule. Another Kremlin crony with apparent involvement is Evgeny Prigozhin, a restaurateur who parlayed his ties with Mr Putin into army-catering contracts and who allegedly controlled the troll factory that hacked elections in the United States in 2016. Russian independent media say that Mr Prigozhin is the main owner of Wagner, a company of private military contractors who have operated in Ukraine, Syria, and parts of Africa (though he denies that the group even exists). Several hundred Wagner mercenaries have now reportedly been flown to Venezuela. Tatiana Vorozheikina, a Russian expert on Latin America, argues that the hollowing out of institutions and the privatisation of state power is precisely what Russia and Venezuela have in common. “When people who control the executive also control the most lucrative economic resources, a country turns into an institutional desert. In this situation any destabilisation is extremely dangerous,” she says. This helps explain Russia’s defensive response to the revolt against Mr Maduro. “We are witnessing how [a crowd] elects a new head of state on a square despite the constitution”, Mr Medvedev tweeted. (Replies included “you idiot, why did you give Maduro $17bn-worth of loans” and “you are next”.) State television channels ascribe Venezuelan unrest, along with the revolution in Ukraine in 2014, to the interference of the United States, and warn of a similar scenario at home. Russia is no mood for a revolution, but as Ms Vorozheikina says, Venezuela serves as a lesson that, however demoralised an opposition movement seems one moment, it can consolidate the next. Alexei Navalny, Russia’s leading opposition leader, has welcomed the protests in Caracas. He attacks the Kremlin for corruption, and for wasting more money in Venezuela than it spends each year on education or health care at home. Mr Putin, who according to the constitution is serving his last term as president, sees Venezuela as a possible precedent. So, undoubtedly, do Russia’s security services and its opposition politicians. The president needs to demonstrate his strength to both. Preventing the overthrow of authoritarian regimes has been Mr Putin’s fixation since Gaddafi’s violent death, which is said to have deeply affected him. The West is trying to cut off Mr Maduro’s sources of money. Meanwhile, according to Novaya Gazeta, an independent Russian newspaper, Russia is providing him with cash, selling gold that Venezuela had deposited in Russia’s central bank for safekeeping and sending dollars to Caracas by the planeload. 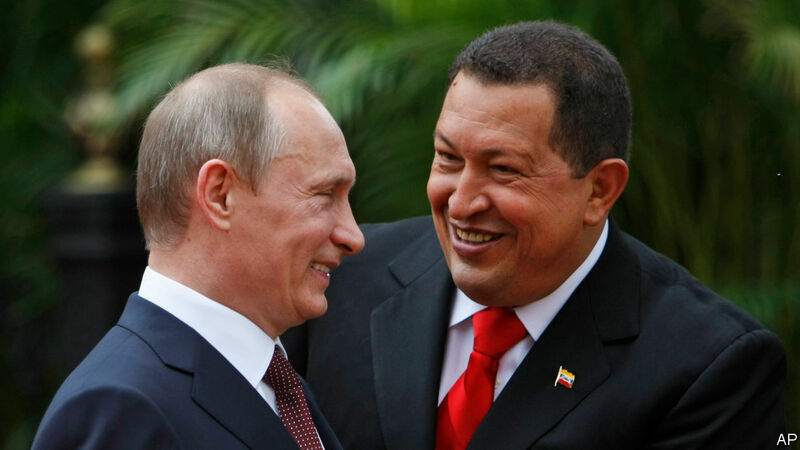 In the longer term, says Mr Gabuev, Moscow may try to build a coalition with Cuba and China to keep Mr Maduro afloat. This does not mean it will deploy its air force to Caracas, as it did in Syria, but it will do what it can to upset the plans of the United States. If Venezuela goes up in flames, Russia can always blame the United States for destroying its investment. But if Mr Maduro does fall, abandoned by his army and hated by his people, Mr Putin would have more to worry about than squandered investments.